Chemical or Radiation induced DNA damage by nanoparticles? In contrast, QED induced EM radiation was proposed at NanoSafe 2010 as the mechanism by which conventional ionizing radiation at UV or higher levels is naturally produced by NPs within the body. QED stands for quantum electrodynamics, EM for electromagnetic, and UV for ultraviolet. By this theory, NPs convert collisional energy from water molecules to ionizing EM radiation, although at low intensity. See http://www.nanoqed.org/ at “Nanoparticle Toxicity and Cancer, ” 2010. 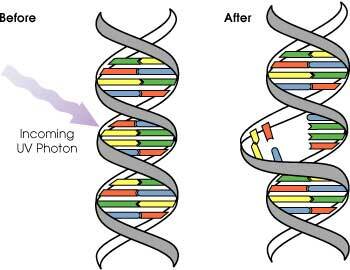 Proponents of DNA damage by chemical reaction do not identify the chemistry necessary to produce the energetics that form the reactive oxidative species (ROS) necessary to mimic DNA damage by conventional ionizing radiation. Typically, ROS require energies in excess of 5.2 eV while surface reactivity of NPs can generate only a fraction of 1 eV. Instead, the NP as a DNA damaging agent is simply assumed to form the ROS, thereby avoiding the lack of surface energetics necessary to initiate the chemical reaction pathway. In retrospect, the reason for proposing QED radiation as the source of UV or higher radiation was precisely to overcome the inherent inability of NPs to produce ROS by chemical reaction through surface activity. The consequence of DNA damage without repair is the unequivocal cause of cancer in man. In this regard, DNA damage may be induced from natural, man-made, and biological NPs, the latter of interest in tumor growth and cancer by disorganization of epithelial tissue. Chemical origins of DNA damage now thought to produce ROS by surface activity are not likely for such a diverse species of NPs. But QED induced radiation depending on < 100 nm NPs and only a weak dependence on chemical species is the more likely mechanism for NP induced DNA damage. 1. QED radiation from NPs producing UV or higher ionizing radiation has sound theoretical basis compared to that by chemical reaction. 2. Given that chemical induced DNA damage by NPs lacks energetics by surface activity and cannot be distinguished from conventional ionizing radiation, it may be concluded that DNA damage by chemical reaction does not occur, and instead QED radiation from NPs is not only being produced, but also is ionizing. 3. Comments that QED radiation from NPs requires experimental proof is understandable, but proof that chemical reactivity can produce the ROS necessary to produce DNA damage is also required.